One of the questions we most commonly get asked from clients who are planning a trek to Everest Base Camp is what do I need to pack? In reply, here's a comprehensive clothing and equipment kit list for the trek, together with some helpful information and advice. 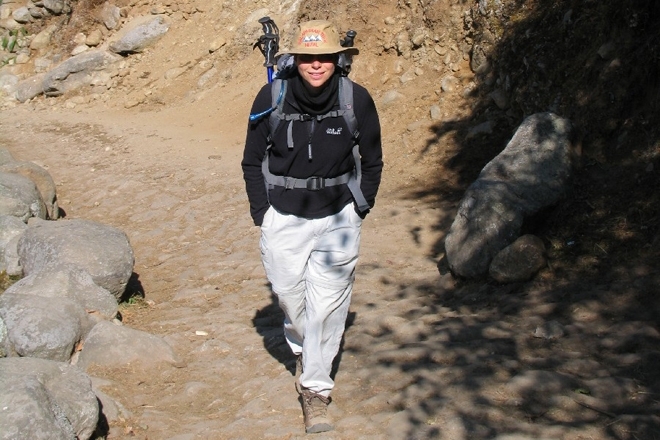 The key to being comfortable on trek is to adopt a system of several layers rather than one item of bulky warm clothing. Sun hats are an essential item, with a wide brim and something to protect your neck. Temperatures can drop very quickly in the evening at altitude and you will need to put on a number of layers once the walking has finished for the day. There are few warmer combinations than a pair of thermal leggings and roomy trekking trousers, with your trunk insulated with a base layer, micro fleece, thermal fleece jacket and a duvet jacket. A disproportionately large amount of body heat is lost through your head (about a third), so just as important as warm body clothing is a warm hat, together with the hood of your waterproof jacket. Don’t forget that your waterproof jacket (which should always be in your day pack when you're not wearing it!) makes a very effective outer warm, windproof layer and is likely to be as often used for this as for its waterproof qualities. Tight fitting, figure-hugging clothing, such as those made with Lycra can often be offensive to locals, especially on women. If you find these items comfortable as a base layer then please pack something to wear over the top of them. Similarly, wearing shorts is culturally insensitive so leave them at home. Calf-length cut-off trousers are fine to take instead. Your boots are your most important item of clothing. Generally speaking we would recommend you use the boots you already use for hill walking. If you do not have any suitable footwear or the pair you have are on their last legs (or feet!) make sure you buy a new pair several weeks before your trek to enable you to fully break them in. In general price is a good indicator of quality – good quality boots will normally cost between £80-£120. Normally an all leather boot is harder wearing and more waterproof but nowadays there are many reputable makes which utilise a mix of leather/nubuck and fabric. It is useful to have Gore-Tex lined boots. Take time in choosing a boot that fits you well (remember to take your favourite pair of walking socks with you when trying boots on!). Tell the assistant exactly what you are going to use the boot for and choose a boot with a good degree of ankle support and a good quality sole such as a Vibram sole. In March 2013 CAAN (Civil Aviation Authority of Nepal) instituted new rules on luggage limits for flights to STOL airports - which Lukla is. The new weight limit is 15kgs, to include hand luggage. This means that they will now weigh both your kitbag and your day pack at the airport which should be within this limit. So you will need to be careful when packing for trek. Our advice is to make sure to wear your down jacket and walking boots for the flight to Lukla and also not to carry too much water on that day - you will be able to fill up with water and repack any extra clothing you're wearing into your kitbag when you arrive in Lukla. NB - So that you don't take unnecessary clothing with you on trek, we recommend you take a spare small lockable bag for any kit you do not need for the trek. This can be left at your Kathmandu hotel, and will give you some clean clothes to come back to. Sunglasses / Glasses - Sunglasses are easy to lose or break, so bring a cheap spare pair. If you wear glasses, bring a spare pair. Contact lenses can cause problems due to dust. Electrical adaptor suitable for Nepal - Standard voltage in Nepal is 220-240 volts. In the Kathmandu hotel there are normally a two-pin razor socket in the bathroom and in rooms generally sockets are round-three pin but can also be European or British variety sockets. Best advice is to use a universal travel adaptor. Tea houses on trek usually have recharging facilities (they will make a charge) but if it's busy there may be a queue for recharging. So there you have it, everything you need (and a little more besides) to help get you to Everest Base Camp. If you've got any questions, or need any advice, then just contact one of our specialist staff who will be very happy to help.